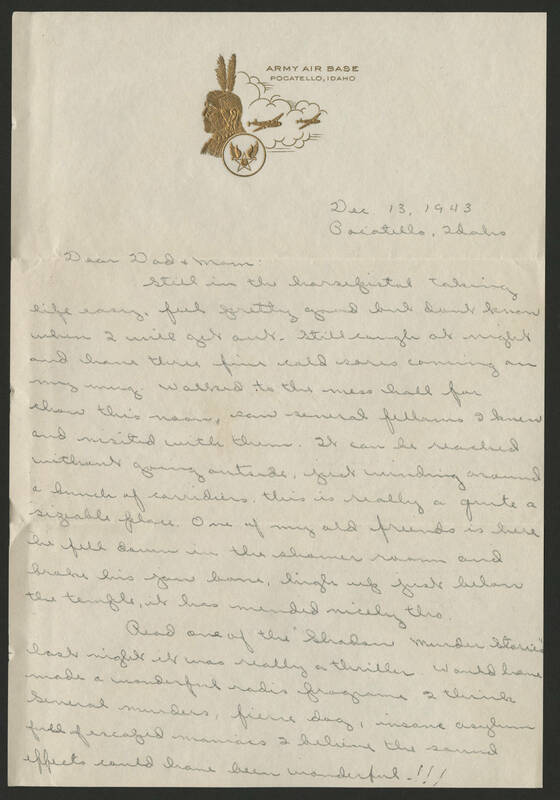 Dec. 13, 1943 Pocatello, Idaho Dear Dad + Mom: Still in the hospital taking life easy, feel pretty good but don't know when I will get out. Still cough at night and have three fine cold sores coming on my mug. Walked to the mess hall for chow this noon, saw several fellows I knew and visited with them. It can be reached without going outside, just winding around a bunch of corridors, this is really quite a sizeable place. One of my old friends is here he fell down in the shower room and broke his jaw bone, high up just below the temple, it has mended nicely tho. Read one of the "Shadow Murder Stories" last night it was really a thriller. Would have made a wonderful radio programe I think. Several murders, fierce dog, insane asylum full of caged maniacs I believe the sound effects could have been wonderful!! !